The magic formula for happy kids this summer is sun, fun and water. 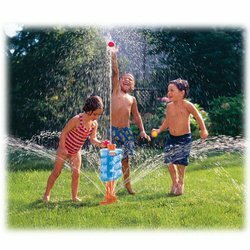 There are so many fun choices when it comes to kids water sprinklers but when it comes right down to it, they will love any choice that you make. Simple and affordable spells hours of backyard fun in the sun this summer. Check out this great selection of toys below. The classic fire hydrant sprinkler attaches to any garden hose for hours of summer fun in the sun. It stands about 8 inches high and spins and sprays water everywhere to a distance of up to eight feet. Great quality and value from Melessa & Doug toys. 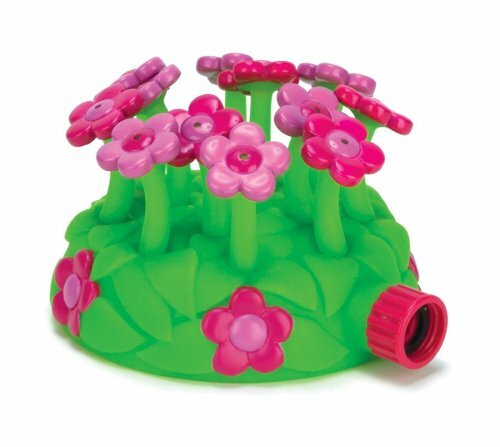 This flower themed sprinkler will keep the kids cool, wet and entertained all summer long. 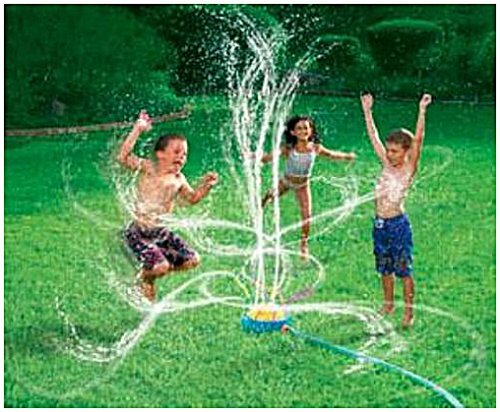 Kids 3 years and up will enjoy the unpredictable spraying action of this fun sprinkler. This becomes a spinning and spraying typhoon and will keep the kids on their toes and jumping around for hours of fun each summer day. 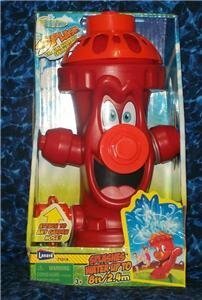 This Little Tikes sprinkler can be placed upright in any area of your backyard with it’s molded right in garden spike. This sprinkler/water toy features a spiral that shoots up balls with it’s powerful jet stream. It comes with four plastic balls and is built durable for endless summer fun. 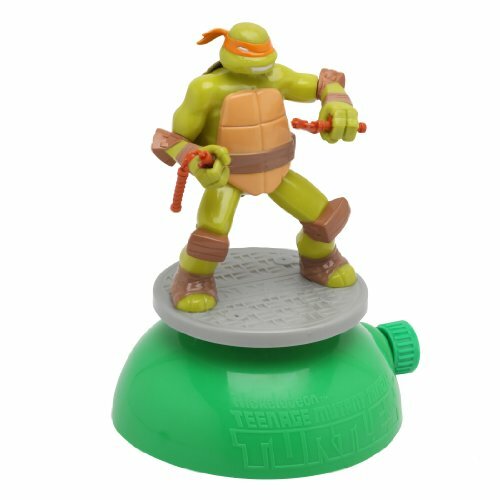 This water sprinkler attaches to any hose and features a spinning Ninja Turtle for hours of fun for the kids. This giant beach ball sprinkler attaches to your garden hose and sprinkles water from four separate holes for double the fun. 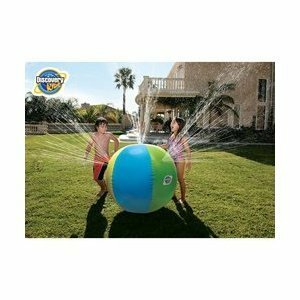 Beach ball and water fun right in your own backyard. Great exercise and fun for kids 3 years and older. This is the classic hopscotch game with a twist. It comes with one water spraying mat and 3 playing chips. It is built with safety in mind with a textured PVC surface for a safe grip. 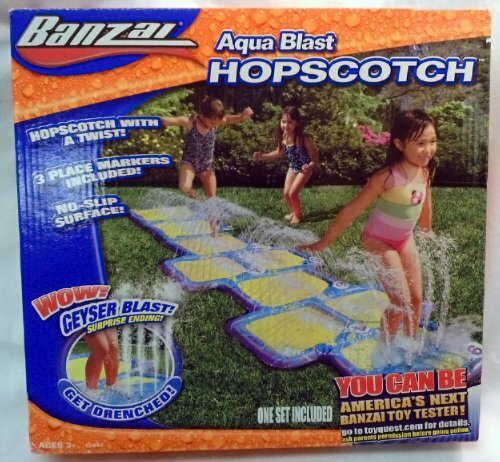 Hopscotch with a refreshing water blast. Sounds like a winning combination for fun this summer. This will definitely be a hit with the kids. It’s a 13 foot ramp and splash pool. Designed for kids from 5 to 12 years old it has a weight capacity of 110 pounds. 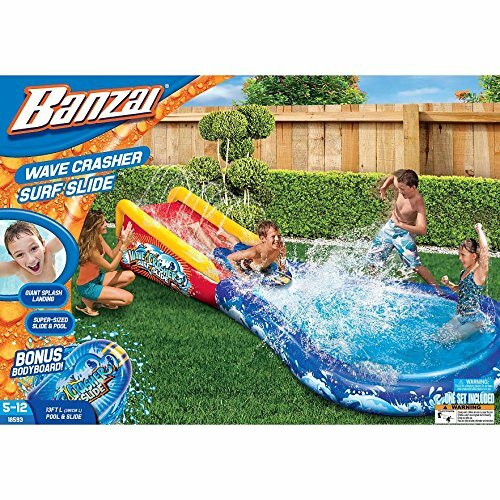 It inflates in about two minutes and the inflatable body board and prinklers keep the slide wet and slick for great exercise and water fun.